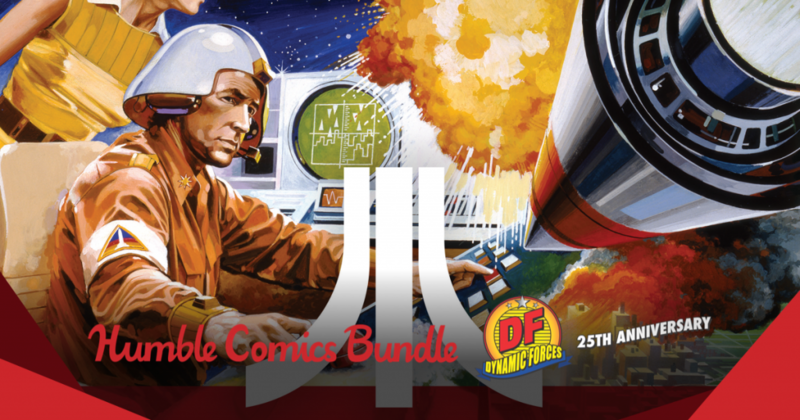 To celebrate Dynamic Forces 25th Anniversary serving the comics community, they’ve teamed up with Humble Bundle to create a treasure trove of comics for as little as $1! Get titles like George R.R. Martin’s A Clash Of Kings #1, Art of Atari, and Ten Frames Per Second. Plus, your purchase helps support Comic Book Legal Defense Fund fight for the First Amendment rights of comic book readers, retailers, and creators! Normally a collection like this would cost you $422, but with Humble Bundle, you decide what to pay! This deal ends April 4, 11am Pacific Time. A collection like this should cost you more than $400, so don’t miss out on this once in a lifetime chance to get all these comics, in any electronic format you want, for whatever you choose to pay! These comics are available in multiple formats including CBZ, PDF, and ePub, so they work on your computer, e-readers, iPads, cell phones, and a wide array of mobile devices! Instructions and a list of recommended reading programs can be found here. Choose where the money goes – between the publisher and Comic Book Legal Defense Fund via the PayPal Giving Fund. If you like what we do, you can leave us a Humble Tip too! The Comic Industry’s leader in pop entertainment and collectibles! DF is the comic book and collectible industry’s top producer of limited edition and autographed memorabilia, including comic books, lithographs, as well as functioning as a packager of comics, and having ranked as high as one of the top 5 suppliers of Diamond Comic Distributors, and a premiere comic and entertainment supplier for United States and International TV Shopping Channels (including being instrumental in QVC US’ Star Wars: Episode III Revenge of the Sith Movie and DVD Release), having placed key items in QVC’s Batman: Begins Movie shows and more! Humble Bundle sells digital content through its pay-what-you-want bundle promotions and the Humble Store. When purchasing a bundle, customers choose how much they want to pay and decide where their money goes — between the content creators, charity, and Humble Bundle. Since the company’s launch in 2010, Humble Bundle has raised more than $90 million through the support of its community for a wide range of charities, providing aid for people across the world.